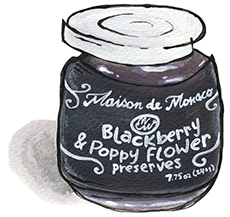 Blackberry & Poppy Flower Preserves for sale. Buy online at Zingerman's Mail Order. Gourmet Gifts. Food Gifts. Luscious fruit flavor with a floral hint of poppy. Coco Guilhem was born and raised in Brittany, France. Her summers were spent making jams with her family, especially her grandmother. There have been a few decades in between that time and today (Coco wouldn't say exactly how many), but after a few career changes and a move across the Atlantic, she's found her passion and making a mark for herself as one of the new wave of preserve makers in the San Francisco area. Coco works in a small professional kitchen space with a couple of large copper kettles and just one employee. Between the two of them they can produce 500 jars a day. She takes eighty pounds of fruit, adds around thirty pounds of sugar (much less than most jam makers) then cooks it all down to about half its original volume. “Everything is about the cooking,” she explains. “I don’t want to overcook the jam or else it can caramelize.” She adds the flower extract at the end because they’re very delicate and can cook off quickly, leaving you with nothing of their flavor. After an hour and half or so, the jam is done. It’s simple, straightforward work but it’s time consuming and takes lots of stirring. Strong arms are a must. “I like that the jam I’m making is so versatile, you can use it on desserts, crepes, cheese, so many combinations.” Coco says. This preserve was originally featured in an installment of the Culinary Adventure Society, our quarterly club for foodies.